Left to right: Sheriff Tom Knight, Crime Analyst Natalie Johnson-Mayer, Communications Operator I Casey Furr, Corrections Deputy Kurtiss Manley, Detective Ben Lubrano, and Colonel Kurt A. Hoffman. 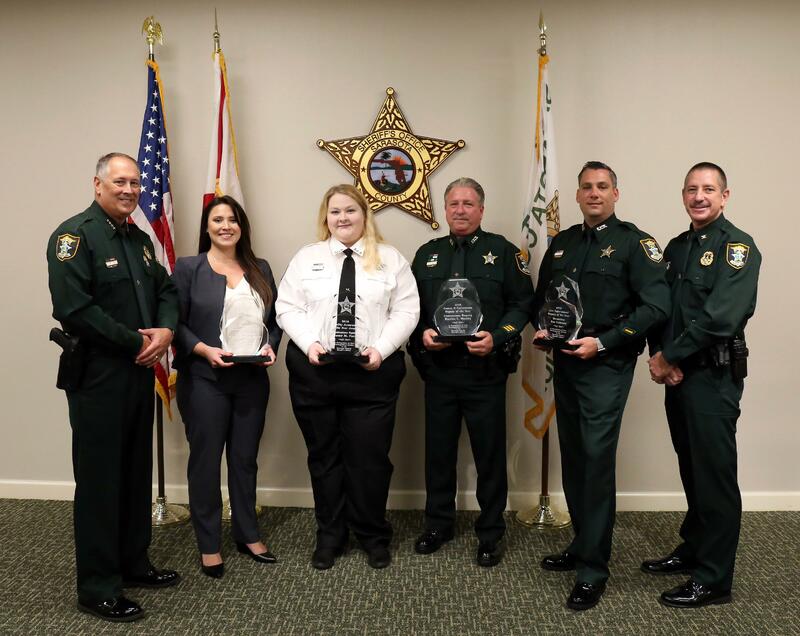 Sarasota County Sheriff Tom Knight today recognized the 2018 Employees of the Year. Detective Ben Lubrano, Law Enforcement Deputy of the Year, joined the sheriff’s office in 2012 and is known for his core values, tenacious work ethic, and team-focused mentality. Currently assigned to the Criminal Investigations Section, Lubrano is recognized for a series of significant investigations in 2018 including a child drowning, home invasion robbery, carjacking and kidnapping case, attempted murder, multiple shootings, and more. Perhaps most impactful however, is Lubrano’s role in the nearly 20-year-old homicide of Deborah Dalzell. Over almost two decades, investigators tried tirelessly to connect the dots and identify the suspect in Deborah’s murder. In 2018, Lubrano was assigned the case and spent weeks researching and working closely with DNA experts to identify the suspect. On September 17, thanks to Lubrano’s hard work, detectives arrested and charged Luke Fleming with Murder. Detective Lubrano gives credit to his colleagues and supervisors but it is Lubrano’s commitment to his profession and crime victims’ that truly sets him apart. Crime Analyst Natalie Johnson-Mayer is recognized as the 2018 Civilian Employee of the Year. Johnson-Mayer joined the sheriff’s office in 2008 and is currently assigned to the agency’s Special Investigations Section. In 2018, the section conducted 21 drug trafficking investigations compared to only seven in 2017, an accomplishment attributable to Johnson-Mayer’s intelligence gathering. One of the investigations led to the largest methamphetamine seizures in the history of the sheriff’s office. Johnson-Mayer worked long hours and on weekends to help detectives locate $150,000 in drug money and put a network of dealers behind bars. Johnson-Mayer was also instrumental in the investigation into the murder of Deborah Dalzell, by assisting detectives to identify and locate associates of Luke Fleming. Johnson-Mayer is known as the “go-to” analyst by her colleagues and even researched and prepared a salary review in 2018 for the crime analyst role, which eventually led to a paygrade adjustment for several analysts. Johnson-Mayer is commended for her knowledge, experience and dedication to duty. Deputy Kurtiss Manley, 2018 Corrections Deputy of the Year, joined the sheriff’s office in 2002. He is currently assigned to the Receiving and Maintenance Section of the Courts and Corrections Division at the Sarasota County Jail. Manley often performs maintenance tasks both within the walls of the jail and at different agency locations, including the sheriff’s office headquarters. Manley is specifically recognized for the significant amount of work he performed to prepare the agency’s headquarters for its debut in late 2017. On both weekdays and weekends, Manley visited the facility to perform tasks while bringing along trustees from the jail to help expedite projects. Not only is Deputy Manley a role model to his peers and colleagues, he is also a mentor to many of the trustees he works with. Manley’s positive attitude and willingness to always go above and beyond makes him a crucial component to the success of the Courts and Corrections Division. Operator I Casey Furr received the 2018 Emergency Operations Bureau Quality Assurance Award. Furr joined the sheriff’s office in 2012 and after completing the call taking program, proceeded through Emergency Medical Dispatch and Emergency Fire Dispatch training. She is also a former member of the Incident Dispatch Team. The Quality Assurance Award is based on a combination of overall quality assurance scores, the number of calls audited and scores on pre-arrival instructions, and Furr scored 100% on all calls reviewed. She is recognized for her dedication to duty paired with professionalism and a consistently positive attitude.